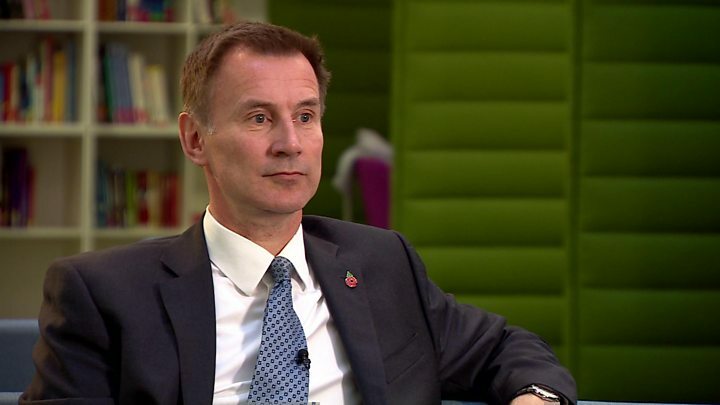 Jeremy Hunt has welcomed the US call for a cessation of hostilities in Yemen as a very positive move that could head off a "terrible" humanitarian crisis. The foreign secretary told BBC Newsnight that a cessation of hostilities could create a humanitarian corridor and deliver a durable peace. He was speaking after the US defence secretary James Mattis called on all parties in the conflict to take part in UN-led peace talks within the next 30 days. The three year conflict has claimed more than 10,000 lives and created the conditions for what could be the worst famine of the modern era. The foreign secretary denied that the UK had been kept out of the loop by the US in light of comments by the Middle East minister Alistair Burt that a ceasefire would be unwise in the absence of a political deal. Asked about the overnight announcements from Washington, the foreign secretary told Newsnight: "This is an extremely welcome announcement because we have been working towards a cessation of hostilities in Yemen for a long time. "Obviously the United States has considerably more leverage with Saudi than we have. But what we have been doing is trying to bring together the Saudi coalition on the one hand, the Houthis on the other, backing the plans by the United Nations envoy Martin Griffiths who I met last night. "If we can land this - we strongly support all efforts to do so - we could create a humanitarian corridor and head off this terrible situation in Yemen where nearly half the population are now dependent on humanitarian food aid. That is incredibly worrying situation." Asked about Alistair Burt's suggestion on Tuesday that a ceasefire would be unwise without a political deal, he said: "This is different to a ceasefire. Ceasefires have to be monitored and they get broken. This is something that we have been discussing with the US and other people for a while. "Essentially this is in a way more profound. This is about a deal where the Saudi coalition would agree to stop bombing civilian areas and the Houthis would agree to stop sending missiles into Saudi Arabia. And there you have the potential for a durable peace that could actually potentially go beyond a ceasefire." The foreign secretary said it was possible that the murder of journalist and critic of the Saudi government Jamal Khashoggi has given the US and the UK a chance to put new pressure on Saudi Arabia. "But we are all very appalled about what happened to Jamal Khashoggi." Mr Hunt said the UK would use its relationship with Saudi Arabia to put pressure on Riyadh. "We have a strategic partnership with Saudi Arabia. Our systems in terms of who we sell arms to are very tightly prescribed by a regime that was actually set up by (Labour foreign secretary) Robin Cook in 2000. "It is because we have that strategic relationship with Saudi Arabia, because America has that relationship that we are in a position to ask them to do things we couldn't do if we didn't have that relationship. And so now what we need to do is use that relationship to push for progress. "It is too early to say there are green shoots. There are still terrible things happening every day. The humanitarian situation is truly appalling. But there is an opportunity now and we must grasp it." The government faced criticism in the House of Commons on Tuesday when the former international development secretary Andrew Mitchell said the UK was complicit in creating the conditions for the famine in Yemen. "I don't agree with Andrew's analysis," the foreign secretary said. "It has been difficult in the Yemen because to date we have had two sides who've both believed that a military victory is possible for each of them. In that situation it is very hard to get people to stop fighting. But we do now have this opportunity and we are absolutely determined to grasp it."